An equestrian statue of Frederick the Great in the middle of Unter den Linden, Berlin, Germany. Photo by Abhijeet Rane, licensed under CC BY 2.0.
by John C. Barentine, Ph.D. When white light-emitting diode (LED) technology appeared on the outdoor lighting market late in the last decade, the world was on the edge of economic catastrophe. At the onset of the greatest global financial crisis since the 1930s, highly energy-efficient LEDs offered a tempting dual benefit to governments faced with an aging outdoor lighting infrastructure: reduced total cost of ownership through lower energy consumption than earlier lighting technologies, and environmental benefits from a “greener” form of lighting. Less than a generation after its introduction, LED is poised to eclipse all earlier technologies in terms of market share. But the world’s rush to adopt LED has brought with it the potential for environmental peril. As early as 2010, IDA helped sound the alarm about the known and suspected hazards associated with the short-wavelength, or blue light, emissions from LED. Governments and the standards organizations that inform them continue to struggle to find a balance between the fiscal benefits and environmental impacts of this new technology. That the conflict remains fresh is clear from the recent release of the European Union’s revision of the EU Green Public Procurement Criteria for Road Lighting and Traffic Signals, known as the GPP. While not itself a binding law, the GPP is intended to advise decision makers on implementation once they decide to install new lighting. The document is an update to guidance first issued in 2012, during the earliest phases of the deployment of LED lighting. Given rapid improvements in LED performance, the EU undertook an effort to update its guidance for governments in a way that gives attention to both energy savings and concerns about impacts to the nighttime environment. While the new guidance is an important step in the right direction, it’s not yet the end of the journey. We are pleased to note some very good elements in the GPP criteria update. Chief among these is mindfulness about lighting levels, increasingly seen as key to a global reduction in both light consumption and skyglow. This involves the principle that the GPP calls ‘As Low As Reasonably Achievable‘ (ALARA) in determining appropriate illumination levels for all lighting designs. SC1 and SC2 (Competencies of designers and installers): The design and installation of roadway lighting must be supervised by staff with certain minimum experience and qualifications. TS2 (Dimming control compatibility): Lighting installations must be compatible with the use of active dimming controls that allow for the programmed switch-off of lights during times of night when road traffic volume is low. TS3 (Minimum dimming performance): All light sources must be equipped with controls that allow dimming to at least 50% of the maximum light output, with a more ‘comprehensive’ dimming goal of 10% of maximum. CPC4 (Commissioning and correct operation of lighting controls) and CPC6 (Compliance of actual energy efficiency and lighting levels with design claims): Tenderers, or contractors, who install and/or operate lighting systems must demonstrate positively that the installations are working properly and meet design goals. This is important in order to ensure that neither energy nor light are being unnecessarily wasted. TS7 (Ratio of Upward Light Output (RULO) and obtrusive light): All lighting systems must be rated as 0% RULO, meaning that they emit no light above the horizontal plane. If new lighting is installed on existing poles, and the light fixtures are deliberately tilted or inclined to the horizontal, then additional shielding must be provided by the manufacturer or installer to ensure that the 0% RULO figure is maintained. TS8 (Annoyance): To reduce the perceived impact of light considered ‘obtrusive’, the color temperature of lighting must be less than 3000 Kelvins in residential areas. Further, dimming or switch-off programs must be implemented according to the procurer’s specifications. TS9 (Ecological light pollution and star visibility): Here, the GPP turns away from correlated color temperature (CCT), a standard approach to characterizing the blue light emission from lamps, and embraces an alternative metric called the ‘G-index.’ In ecologically sensitive places, the guidance recommends that the G-index of lamps be no less than 1.5, while near astronomical observatories it should be at least 2.0. The GPP also calls for dimming or switch-off schedules to limit the total nighttime light emission in these places. Many of these elements are broadly consistent with the Low Impact Lighting (LIL) standard promoted by German, Italian and Slovenian members of the European Environmental Bureau in the past decade. If EU member states broadly adopt the GPP guidance, better agreement among roadway lighting practices across Europe would result. It could also be beneficial in reducing light pollution in some cases. We are especially gratified to see the GPP authors call for a new metric dealing with blue light. This appears to be a first for a major, international best-practice document. Yet we note a number of missed opportunities in the GPP to take a more aggressive stance against light pollution throughout Europe. Such a position would bring the guidance closer to achieving truly “green” goals. The GPP promotes LED as the only viable lighting technology based only on its perceived social benefits and lower cost of operation. At the same time, it downplays many of the environmental concerns that have been raised concerning LED use. For instance, the GPP technical report claims without evidence that “for any given lighting level requirement in an installation, there is a clear link between environmental benefits and improved energy efficiency of light sources and luminaires.” (p. 27) Given the world’s continued dependence on carbon fuels, this contention seems reasonable at first glance. However, its ultimate truth depends on ensuring that the cost savings from the use of more efficient lighting is not simply redirected into the purchase and installation of more lighting. There are many instances in history in which technology improved the efficiency with which a resource is produced, but the rate of consumption of the same resource rose due to increasing demand. Consistent with this tendency, it seems that the economics of the global transition to LED do not favor the careful consideration of outdoor light use. Until public policies mandate reduced consumption of light, rather than the energy used to produce it, the next best approach might well be to limit expenditures on public lighting in a way that caps both the total emission of light and consumption of electricity. The GPP revision process considered, but ultimately did not adopt, a per-capita energy consumption limit recommendation. As a result, steadily increasing efficiencies among new LED products may well further undermine their purported environmental benefits. If the premise of substantial overall energy savings from LED is untrue, then the sense of urgency to complete the transition is diminished. Ultimately the GPP focuses too much on costs as a deciding factor even while claiming to be ‘green.’ A tension between light pollution and cost concerns exists in the guidance that never goes away. As an example, the recommendation in benchmark TS7 of a 0% upward light ratio for new lighting systems is weakened by unease about the cost of new lights and mounting poles required to maintain uniformity of illumination. Elsewhere, the technical report warns about “possible cases where dimming control might not pay back” the cost of equipment. Worse for skyglow, the GPP relies on the international EN 13201 lighting standard that calls for unreasonably high roadway illumination levels, despite the fact that the recommended values are not based on any specific scientific evidence linking them to public safety. While the GPP acknowledges this shortcoming, its authors fall back on the notion that the document’s purpose is not to determine whether lighting roads is necessary in the first place. And, fearing differences in energy efficiency that have steadily vanished in recent years, the guidance only insists on the IDA-promoted 3000 Kelvin correlated color temperature standard for certain types of installations. Despite its shortcomings, the GPP update is not fundamentally flawed. The influence of IDA and our network of advocates in Europe in the stakeholder input to the new guidance is clear. The result is a distinct improvement over the 2012 edition, and it includes a number of principles that are consistent with the approaches that we know reduce light pollution and skyglow. We applaud the European Union for promoting these principles, and we encourage it to continue in this direction. But we also think the EU should take a more appropriately skeptical view of claims of environmental benefits associated with LED use until evidence to the contrary emerges. 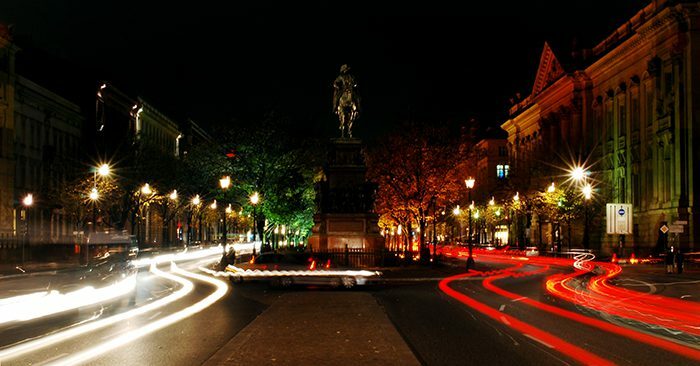 We think that the EU will find that there is more to roadway lighting than just energy consumption and public safety, and that moderation of light use itself can better help the EU meet its climate change goals. IDA promotes its own guidance for the effective implementation of LED lighting that include sensible protections for the night sky and the nighttime environment. You can view these guidelines here.